These shears are made by one of the leading gardening brands in the world, namely Spear & Jackson. If you have ever used any of their tools, then you will know that they are very well made. They are also tough, durable and built to last for years. This certainly applies to these shears which are very sharp, and highly effective as both hedge and grass shears. The steel blades are coated with a hardened carbon. That makes them not only tough, but will help protect them from rust. The upper blade is also coated with PTFE, and that helps with a nice smooth cut, and also stops the exposed part from rusting as well. This is the best selling set of shears on Amazon UK, and in many other online stores. There are of course very good reasons for that. Buyers rate this product highly, with an overall satisfaction rate of a very high 94%. What Buyers Say and How They Rate These Shears? Just below we have included the main important parts of these shears and why they will make your hedge cutting and lawn edging a great deal easier, should you decide to buy these. Uses an effective set of gears, to make cutting very easy and fast, really helps to reduce hand and arm fatigue. They are PTFE coated and that minimises any chances of rusting through sap moisture, or if they are left out in the rain by mistake. The total length of the shears is 56 cm (22") and they weigh 880 grams. You can use these for cutting hedges, cutting grass and also for cutting the edging on lawns and flower beds. Here at this website we have read hundreds of reviews about this set of geared hedge shears from Spear and Jackson. We then pull that information together in a simple pros and cons table of what buyers said they liked and what they did not like. There are thousands of gardeners who own this product and it has a 94% satisfaction rating. They are the best seller on Amazon, and you don't get to be that, unless the product is excellent. As far as garden shears go, I think these are easily the best on the market right now. If these are not your idea of the right shears for you, then please click here for a full list of out top 10 hand shears. 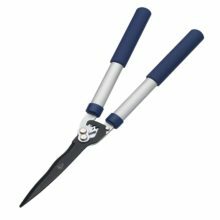 With a 10 year guarantee, an affordable price and such a very high buyer rating, we know that you will struggle to find a better set of hedge shears than this set from this well known gardening brand. 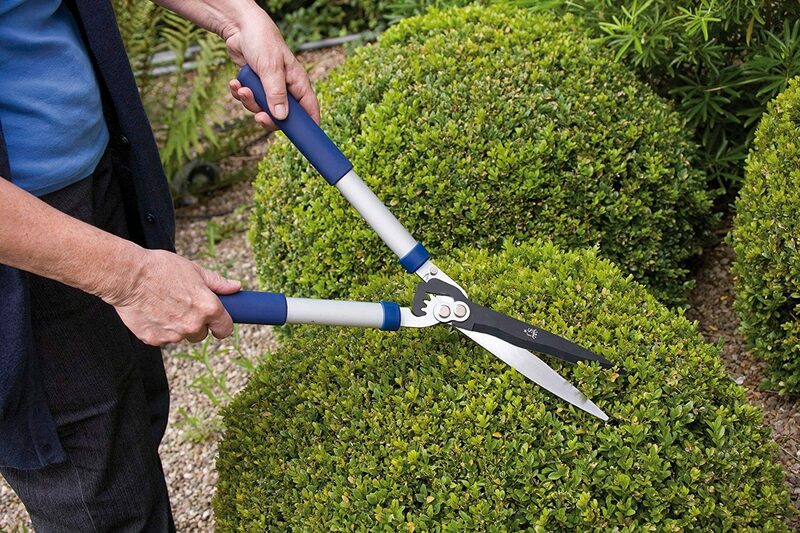 These geared hedge shears are ideal for cutting and shaping hedges. You can also use them on many different type of shrubs. The simple fact that they use a a geared mechanism makes life for people who are not as strong as they used to be, a great deal easier. Add to the above facts that the carbon steel blades provide long lasting sharpness, you will own a high quality set of shears that will quite literally last you for many years to come. These are a good choice for cutting and shaping hedges and shrubs.